In a tropical country like India, a ceiling fan is a must-have electrical appliance for any household. While it is true that ceiling fans are available in many varieties of shapes, sizes, styles, and tailored for particular purposes, purchasing the ideal ceiling fan for your home can be quite overwhelming if you lack adequate knowledge on the matter. Let us guide you on this matter and help you avoid the buyer’s remorse. Here are seven things to look out for a while buying a ceiling fan. Once the above factors are done with, you need to check out the fan’s efficiency or its CFM. A fan’s CFM (cubic feet per minute) represents the amount of air it can circulate or move per minute. The higher a fan’s CFM, the more efficient it is for it will distribute a significant amount of air per minute, thus, providing better cooling. This is one of the essential components of a ceiling fan. The motor quality greatly determines the efficiency of a fan. 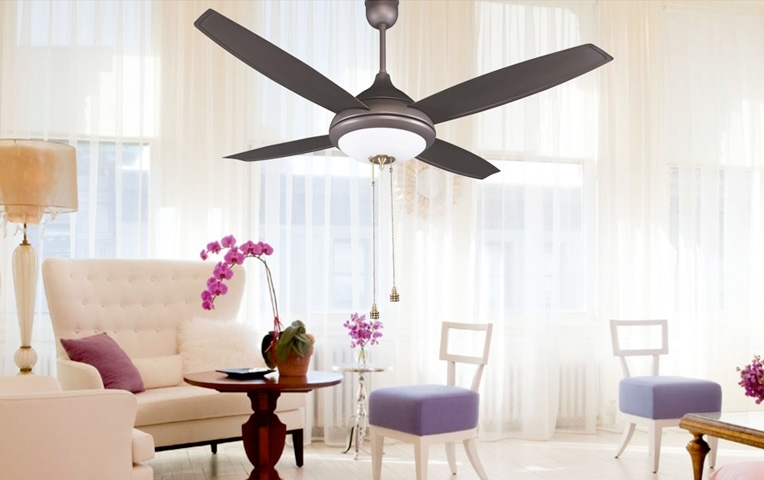 Ceiling fans with high-performance motors such as DC or BLDC motors are the most efficient ones in the market now. These motors do not get heated up even after long hours of use and operate noiselessly. Since no heat is generated, the energy loss is minimum, making these ceiling fans the most energy efficient ones. Also, look out for ENERGY STAR labeled ceiling fans for they deliver excellent performance while consuming minimal energy. Atomberg’s Gorilla range of ceiling fans is the perfect example of energy efficient fans with powerful BLDC motors. Ceiling fans are available in varying blade sizes and styles. Although it is a common tendency to believe that fans with more number of blades are more efficient, it is not always so. Fans with more number of blades can only perform efficiently when equipped with powerful motors that can help overcome the aerodynamic drag. A fan with four blades is the ideal choice. Moreover, the blade pitch (angle of the blades) of the fan is also important. The standard pitch is between 12-15 degrees, and anything less than that will make the fan inefficient. Purchasing a fan with a good warranty policy is the wise way to go. Most reputed fan manufacturers provide a warranty of about 3-4 years, repair and maintenance included. By purchasing the fans of those brands, you’d save yourself the hassle of repairing issues that usually crop up with prolonged usage. With so many unique styles of ceiling fans ruling the market now, you have a wide range of choices. Vintage and antique style fans, modern ceiling fans, ceiling fans with lights and ornamental pull chains, handcrafted ceiling fans with wooden/brass blades, and so much more. Choosing the right style of a ceiling fan according to your room decor will enhance the style quotient of the room. So, the next time your purchase ceiling fans, be sure to keep these few tips in mind!